Vinyl LP pressing. 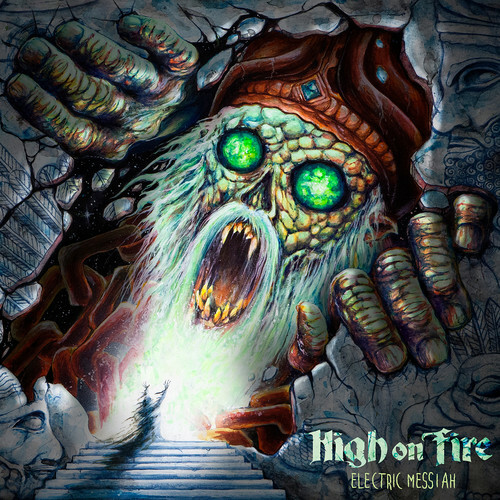 "I had a dream about Lemmy," says Matt Pike, explaining the inspiration behind the title of High on Fire'striumphant eighth album Electric Messiah. If there's one aspect of the band that warrants comparison to Lemmy's mighty Motörhead, it's longevity. 2018 sees them celebrating 20 years of thunderous heavy metal, with brothers-in-arms Pike, bassist Jeff Matz, and drummer Des Kensel having been firmly intact for the last dozen years. Along the way the band has forged a distinct identity of towering riffs, a propulsive rhythm section, shredding solos, and lyrics of Hessian poetry. "This is by far the best record I've ever made with the High on Fire stamp," Pike adds. "It just keeps getting better and better. We just try to outdo ourselves. I'm not saying the old work is progressively worse, it's just that we get better every time instead of burning out, which is a common finality for a lot of bands. This album is f***ing excellent, I just love everything on it, I'm not bummed about anything. It's great when you think that about your record."